338 including 1 crater plate & 1 lunar landing plate. No stickers! 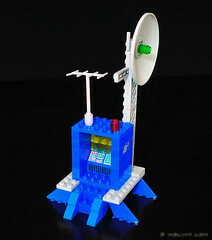 Growing up, I used to pour over the Lego catalogues. 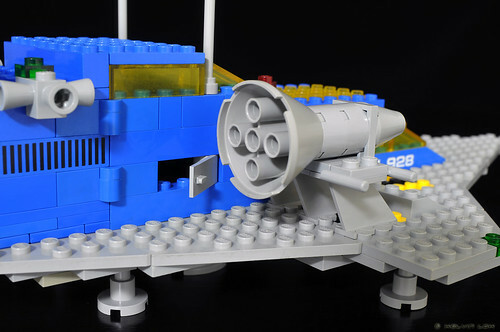 As a young boy interested in spaceships, this big set has always been top of my want list. Alas, parents only willing to buy the smaller sets for me. 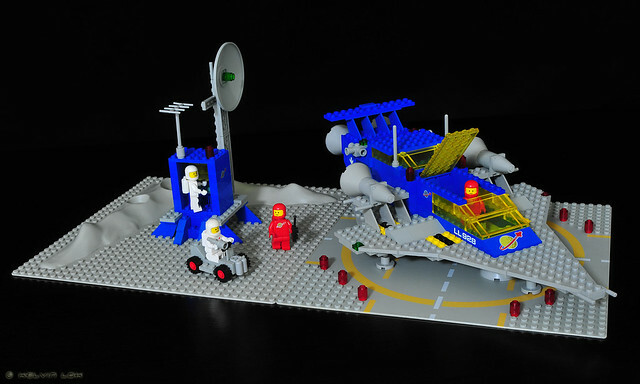 Fast forward to the present, I saw this set featured in the 2009 LEGO Book by DK and triggered the desire to own it one day. 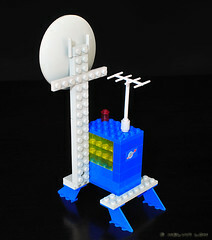 Finally found a complete and reasonable price set on Bricklink, and here it is! This set can be divided into 3 parts: the scout rover, the communications outpost (and baseplates) and the spaceship itself. The scout rover is a very simple design, built with basic pieces. Main playability is to fit inside and deploy from the Galaxy Explorer’s cargo bay. The outpost is a nice structure, especially the Classic Space logos on the sides. 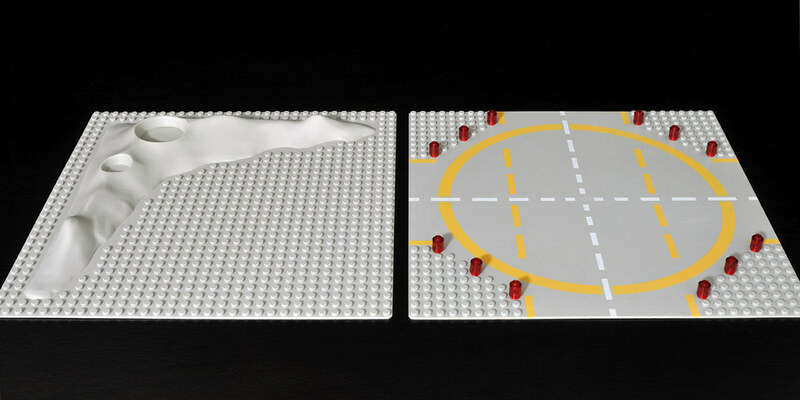 It can be removed from the crater plate and placed on any flat surface. The crater plate is more for diorama purpose. The landing plate though is my favourite baseplate! 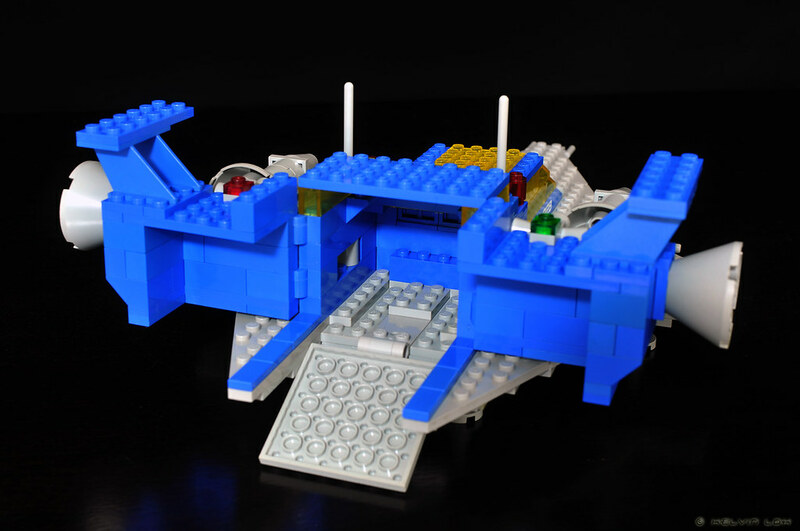 It will enhance any Lego spaceship including Star Wars ships. 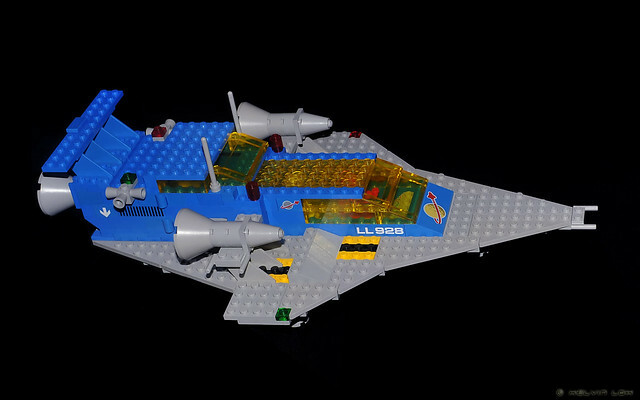 The spaceship itself just screams “CLASSIC” from the aerodynamic shape to the grey/blue/yellow colours combo. 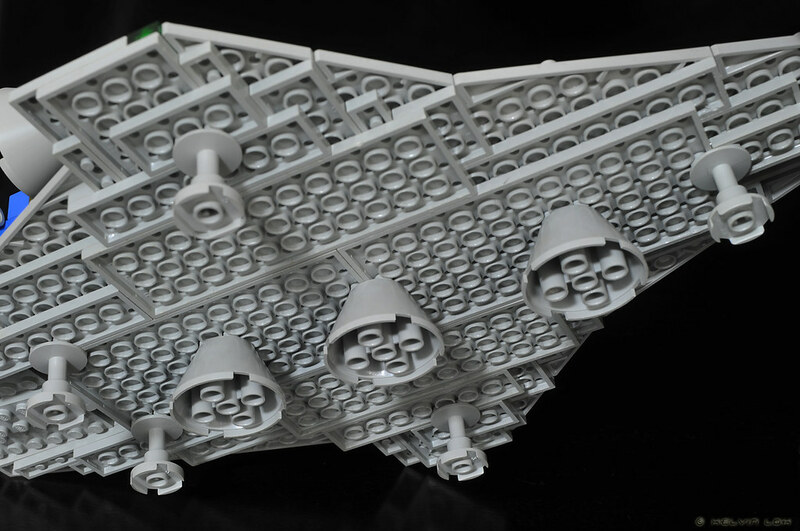 Yes wings are redundant in space, but they certainly enhance the design. Who knows, this ship might need to land on some worlds that has atmosphere. Underside of the ship has 3 big lift engines. As the first series of classic space ships, I like to think that this reflects the early stage of space travel and anti-grav tech have not been invented yet. If you prefer to remove them, can just say it has been retrofitted with anti-grav. Big engines mounted above both wings. Again, can pass off as early space age and design not refined yet. Not sure what the swing-out doors are supposed to be though. Storage compartment? Maintenance access? Speedbrakes? Best feature of Galaxy Explorer is the rear cargo bay with split-apart fuselage and lowering ramp. Big enough to accommodate the scout rover. 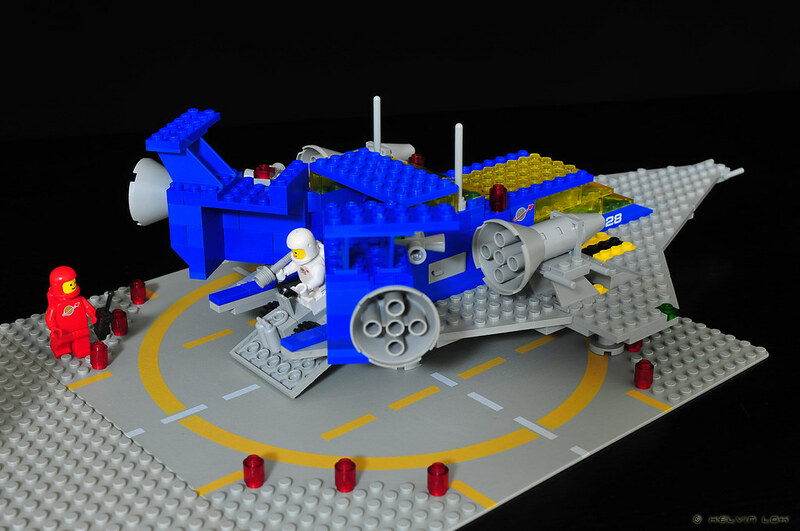 As a kid I love toys that can deploy smaller vehicles from a bigger mothership. As a grown-up now, I have to wonder since the engine is mounted just behind the cargo bay, where are all the engine parts?? The cockpit cabin is spacious enough to accommodate a second minifig as copilot. 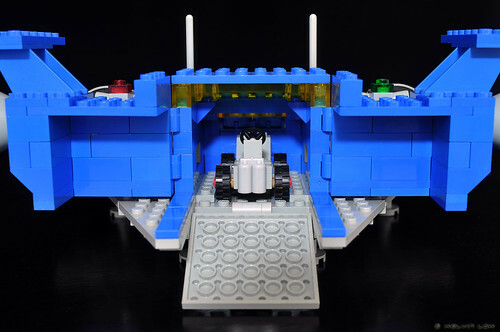 Can simply add 2x2 control panel bricks to create a second cockpit. - Rear cargo bay to store the scout rover. - Simple yet enjoyable build, no repetitions. 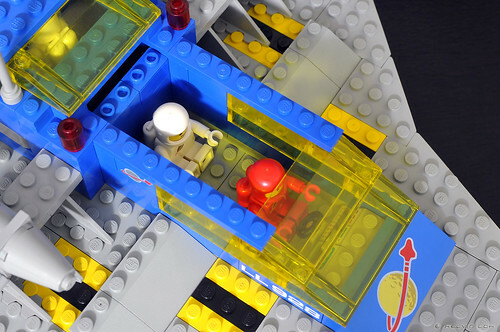 - Cabin has no cockpit details for second minifig. 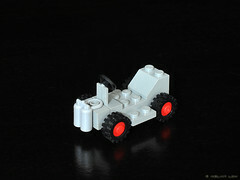 - Scout rover is simple. This Galaxy Explorer is the Queen of my Space Fleet.